This page is part of a mainly German written site. Beeing an AWB-affiliate representing the Linzer Astronomical Society - LAG / AUSTRIA I am happy to report the following historic event at my hometown Linz in Upperaustria. 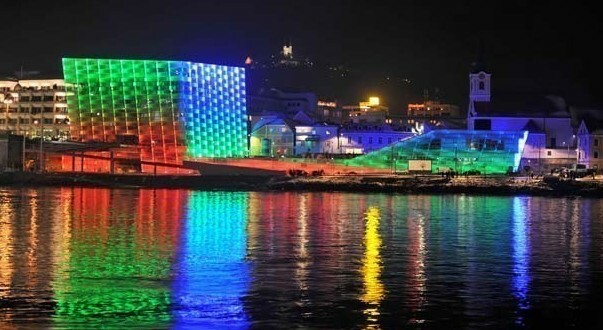 View of the illuminated AEC-building at river Danube. 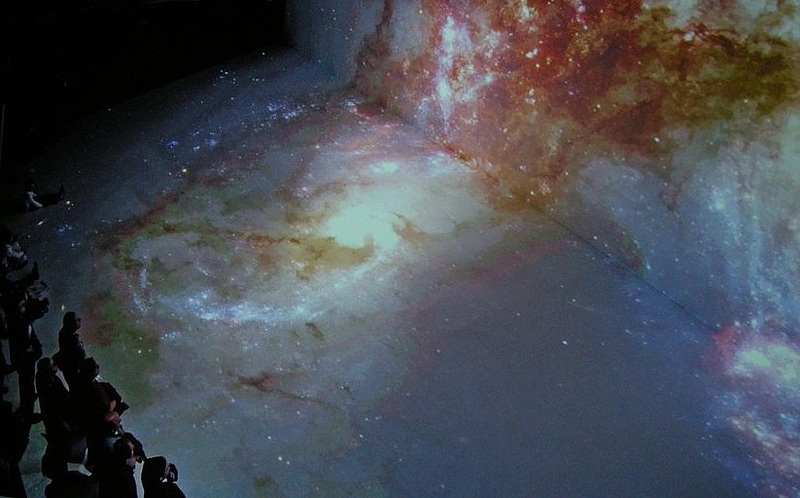 LAG Member Dietmar Hager (he is a well known international astrophotographer called "stargazer") used the original 3D CAD-Datafile of European Southern Observatory (ESO) on 24. 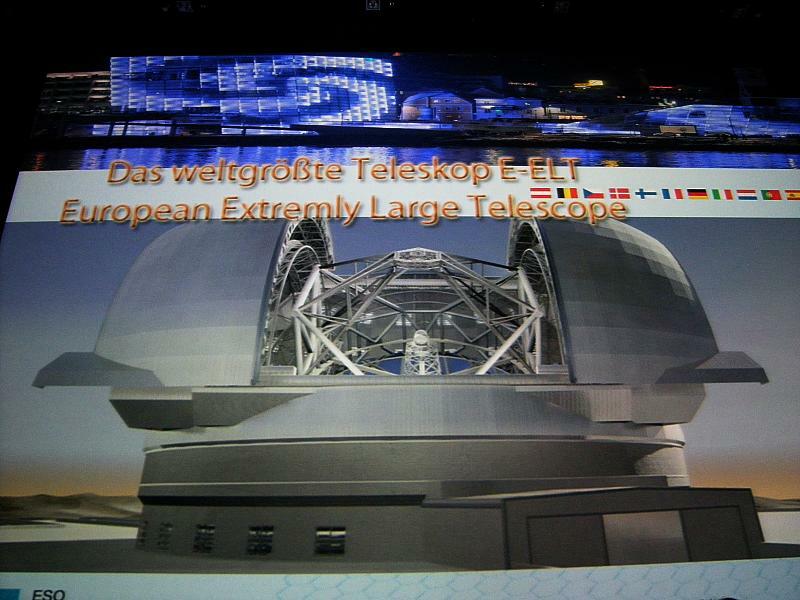 Juni 2010 in Ars Electronica Center(AEC) (Linz/AUSTRIA) to introduce the world biggest telescope planned by ESO: The so called European Extremely Large Telescope (E-ELT). 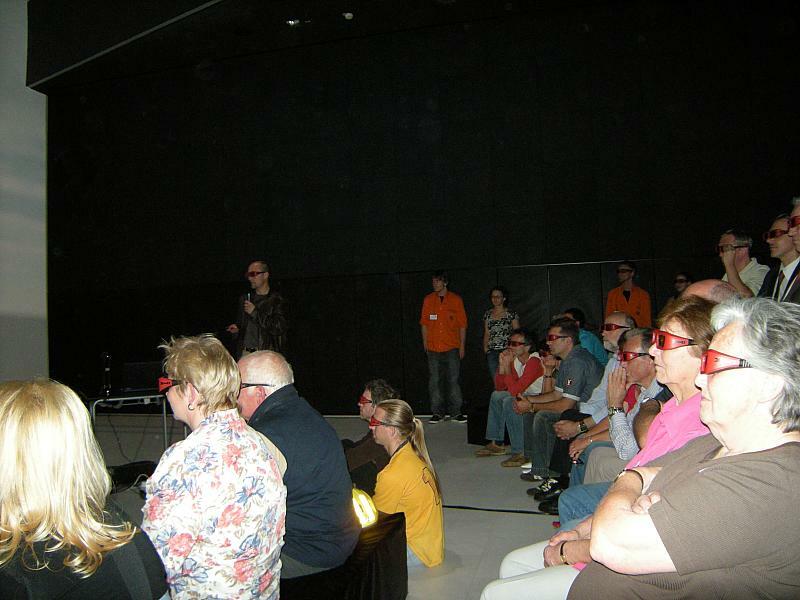 The numerous visitors had the unique opportunity to make a virtual walk in Deep Space at AEC in 3-D Stereo through the construction, already before the construction of this telescope started in reality. 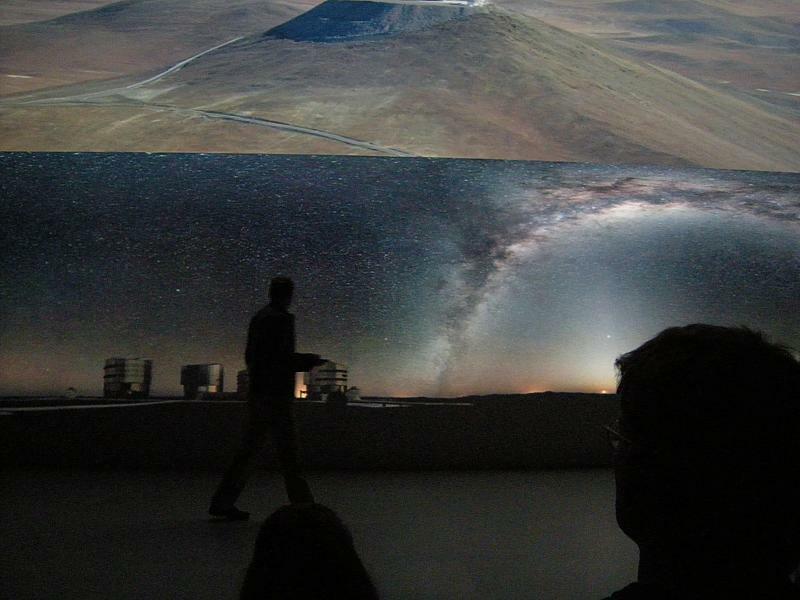 The technical heart of Deep Space, the eight 1080p HD- and Active Stereo-capable Barco Galaxy NH12 projectors, combined with the team of AEC-programmers, have again proved their worldwide uniquiness. Dietmar Hager presented, familiar with the complex technical equipment of AEC, entertaining but equiping the visitors with knowledge. 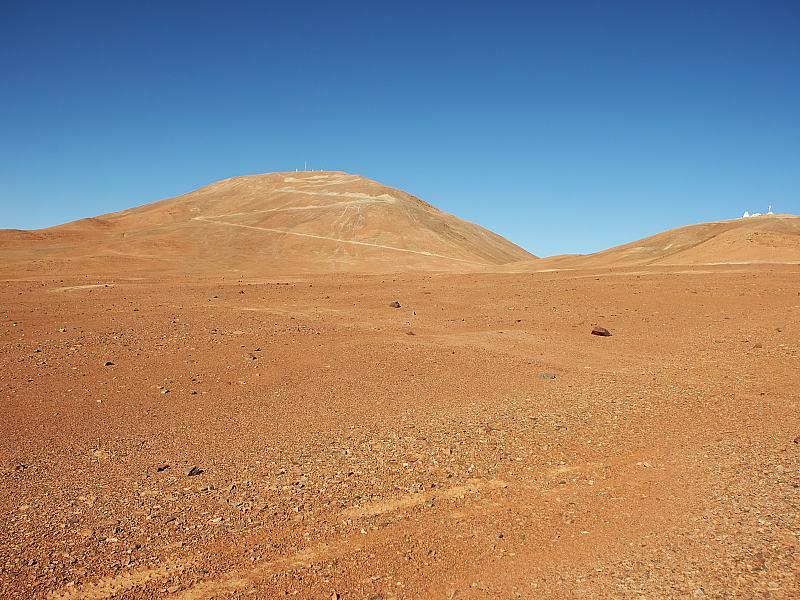 The visitors have been situated sometimes inside the big telescope und the colossal dome and they embarrassed, or better said hovered over the 42 meter primary mirror (consisting of 1000 segments). 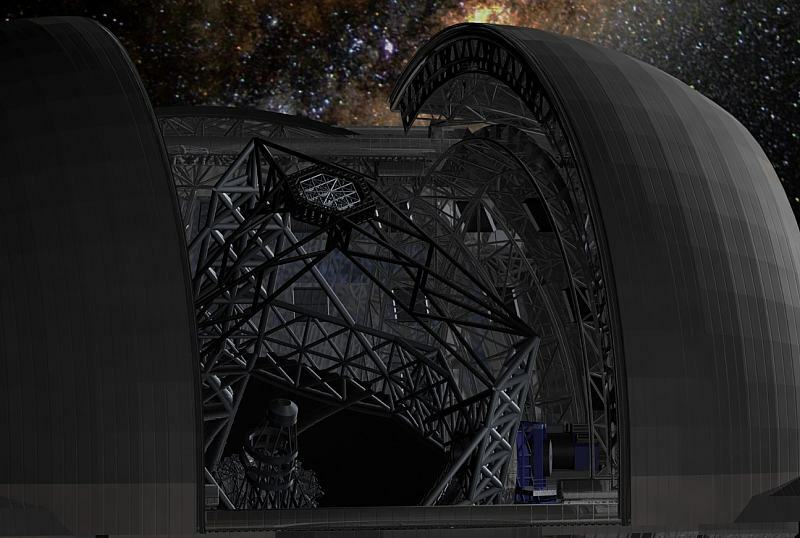 The giant dimension of this biggest telescope, that mankind is going to make, was a tight experience. From inside of the telescope we did a look to the far Chilean desertmountains to the neighbourhood of the VLT (Very Large Telescope). Beside many technical details Dietmar Hager told about the future importance of this telescope concerning our conception of the world. The potential of this international telescope may influence - maybe change - our worldview, like 400 years ago when Galileo looked through his first telescopes. Additionally I am proud to tell that here in my home town Linz the software for controlling the optics for this 42meter telescope will be developed. This 4 years lasting project will be coordinated by Professor Ronny Ramlau at Institut Industrial Mathematics of the Johannes Kepler University Linz. It's a cooperation of the Institute Industrial Mathematics, the Johann Radon Institute for Computational and Applied Mathematics (RICAM) the Austrian Academy of science (Linz) and the Industrial Mathematics Competence Center. 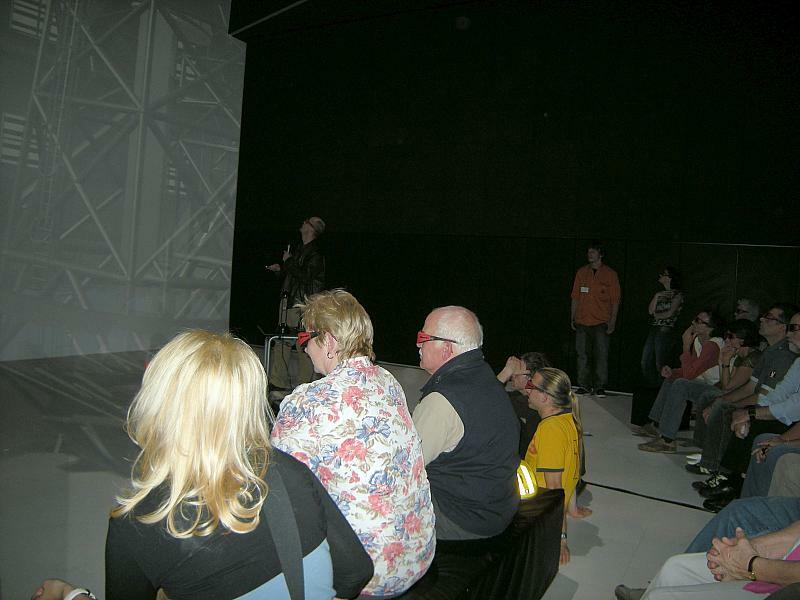 Dietmar Hager in front of the video wall. 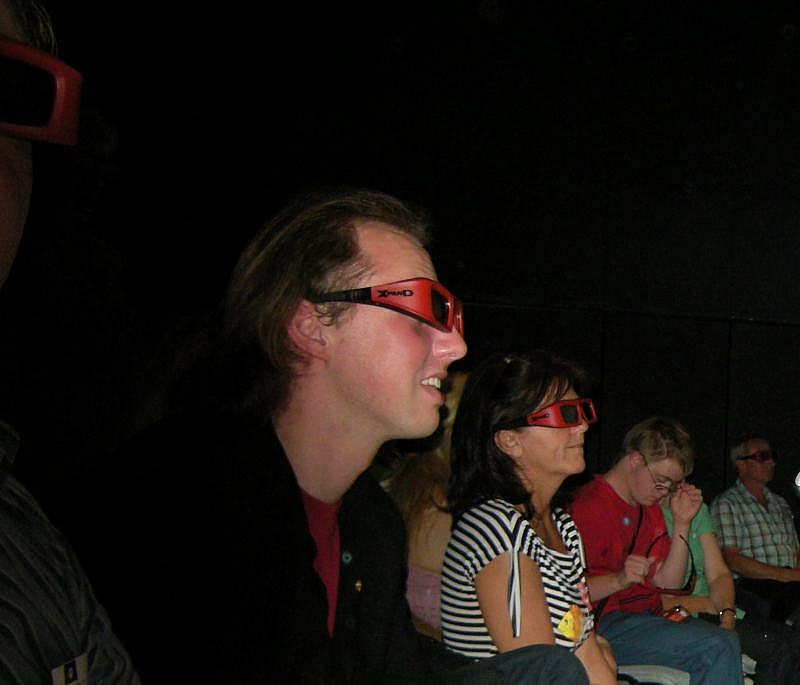 Using 3D-goggles the visitors had the illusion to be inside the structure of the telescope. 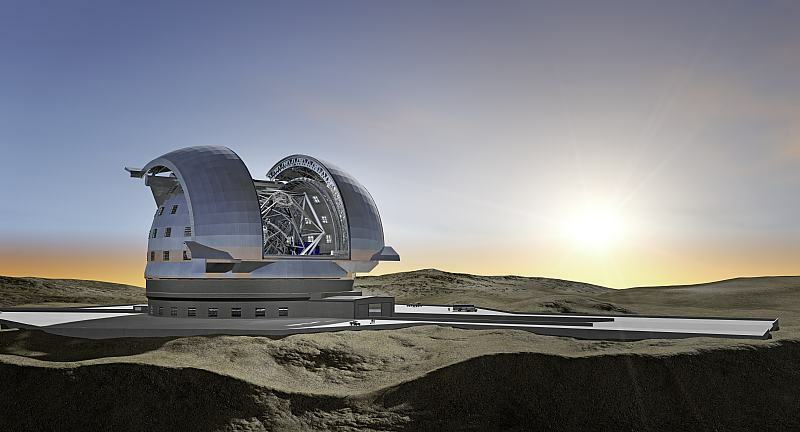 ESO is currently designing the European Extremely Large Telescope (E-ELT), which, at 42 metres in diameter, will be the world’s biggest eye on the sky when it becomes operational in 2018. The E-ELT will tackle the biggest scientific challenges of our time, and aim for a number of notable firsts, including tracking down Earth-like planets around other stars in the “habitable zones” where life could exist — one of the Holy Grails of modern observational astronomy. A description of the exciting science this telescope will allow is available in a new brochure ESO has just released. The mirror design itself is revolutionary and is based on a novel five-mirror scheme that results in an exceptional image quality. 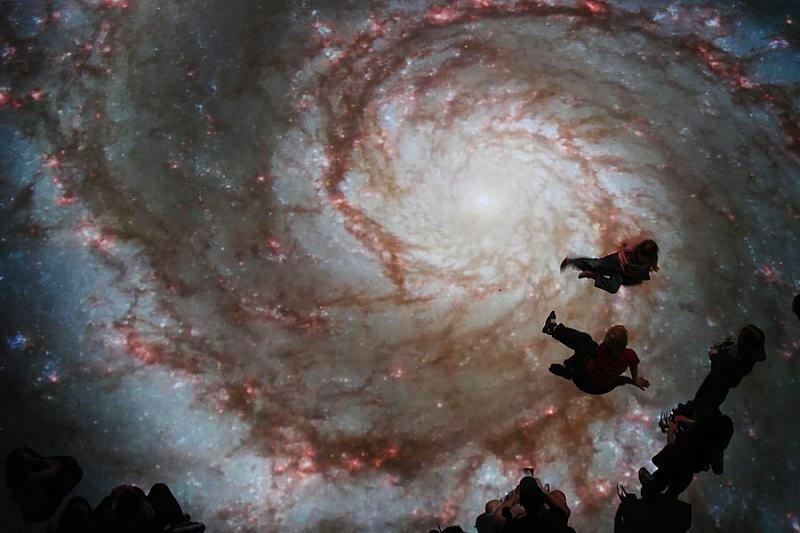 The primary mirror consists of almost 1000 segments, each 1.45 metres wide, but only 50 mm thick. The optical design calls for an immense secondary mirror 6 metres in diameter, almost as large as the biggest primary telescope mirrors in operation today. 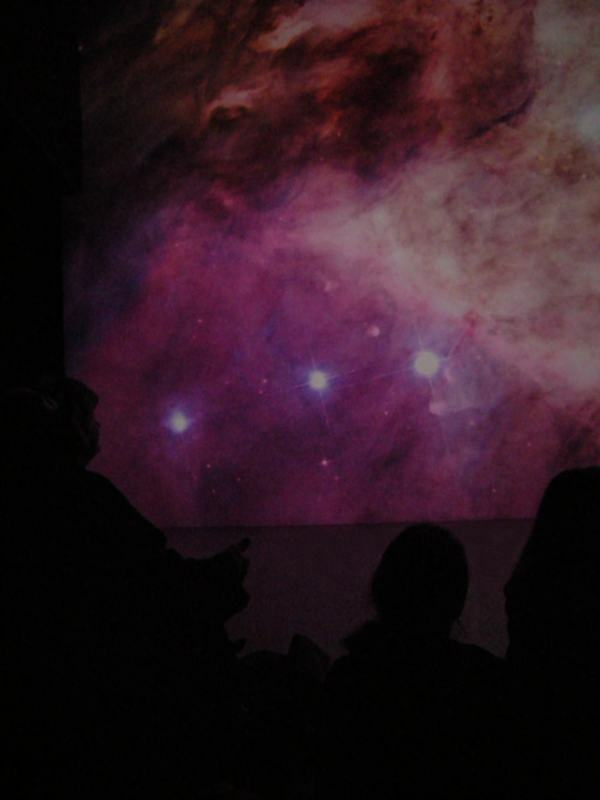 Adaptive mirrors are incorporated into the optics of the telescope to compensate for the fuzziness in the stellar images introduced by atmospheric turbulence. One of these mirrors is supported by more than 5000 actuators that can distort its shape a thousand times per second. The telescope will have several science instruments. It will be possible to switch from one instrument to another within minutes. 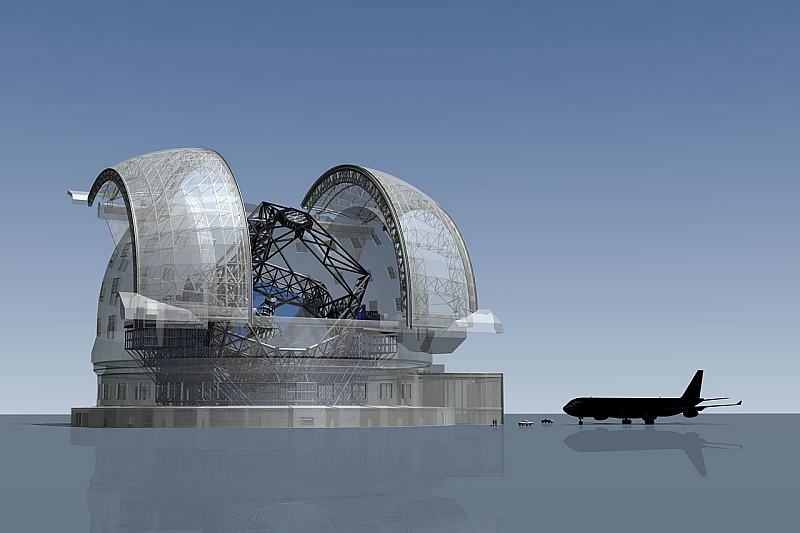 The telescope and dome will also be able to change positions on the sky and start a new observation in a very short time.